Defensive driving is both a safety course and a driving style introduced by the Department of Motor Vehicles (DMV). It teaches drivers to be mindful of other vehicles on the road, avoid distractions, and adjust their driving style to the road, traffic, and weather conditions. Here are some simple tips paired with features on the new Cascadia to help implement this style of driving within your fleet. Inclement weather, lane closures, and accidents can cause unexpected stops or slowed traffic. Advise drivers to keep a safe following distance in the event they need to stop. 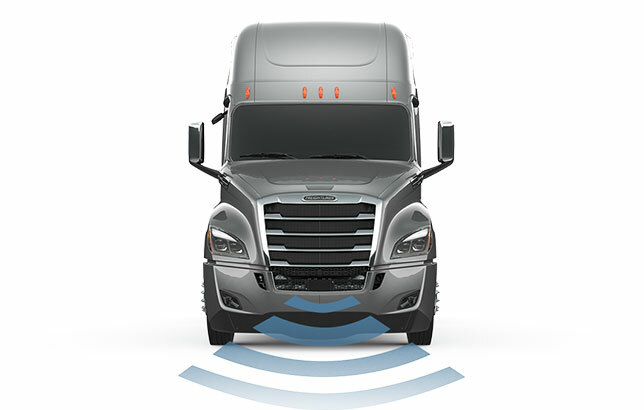 The new Freightliner Cascadia offers the Detroit Assurance® Suite of Safety Systems, including Active Brake Assist and Adaptive Cruise Control. This radar system helps drivers maintain a safe following distance and mitigate potential collisions. Severe weather can significantly affect visibility on the road. For all inclement weather conditions advise drivers to reduce their speed and utilize tools to help maximize their visibility. The new Freightliner Cascadia is the first OEM to offer standard full-LED exterior and interior lighting for improved visibility at night, and standard heated exterior mirrors to help drivers see the road in the event of snow, sleet, or ice. If a truck’s equipment is not properly maintained and inspected, it could lead to larger issues or breakdowns. Be proactive by conducting pre- and post-trip inspections. The new Freightliner Cascadia offers an optional pre-trip vehicle inspection system that flashes all exterior lights for a quick and complete inspection before drivers hit the road. Driving for long stretches of time can lead to mental and physical exhaustion. Encourage drivers to be mindful of their needs and take breaks so they can stay alert on the road. The new Freightliner Cascadia has an all-new Driver’s Loft with a two-seat dinette that folds down for a swing-out full-size bed and dimmable LED halo lighting for reduced eye strain. It also has a new front suspension for a smoother ride and less driver fatigue. Emails, phone calls, text messages, music choices, and navigation systems simultaneously demand attention. Encourage drivers to dock devices and only check them when they stop. The new Cascadia features a low-mounted, ergonomic wraparound dashboard with easy-to-reach switches and steering wheel controls to help keep eyes on the road.